Only he is capable of understanding all the facts, and only he sees the significance of every detail. That’s why it is so important that we test it all by his Word. “Your road led through the sea, your pathway through the mighty waters—a pathway no one knew was there!” (Psalm 77:19 NLT). The Bible says God actively works through our circumstances. And so we cannot judge our situation apart from God’s wisdom. In other words, we must leave it up to God to interpret our circumstances. Only he is capable of understanding all the facts, and only he sees the significance of every detail. That’s why it is so important that we test it all by his Word. If you feel overwhelmed or confused about a decision, you might be caught up in yourself and not God’s voice. The Bible says, “God is not a God of disorder but of peace” (1 Corinthians 14:33 NIV). He is not the author of confusion. So if you’re feeling confused, guess what? It’s not God’s voice speaking in your life. So many times we come up against enormous financial, spiritual, or physical barriers. That’s when we need to confess, “God, there are mountains on either side and an impassable barrier in front of me.” And then we wait for God to respond: “I’ve got you exactly where I want you to be. Watch this.” God will make a pathway where there seems to be no way. When you don’t know what to do, God will guide you. He didn’t design you to go through life on your own ingenuity and power. You don’t have to just hope you can figure things out. 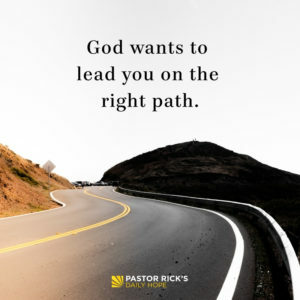 God wants to lead you on the right path, and he will when you surrender to him and his guidance. When you’re frustrated because God doesn’t seem to be answering your prayer for guidance, what do you think he wants you to do? What have you learned through those kinds of experiences in the past? How has God used your pain to show you his purpose for your life? Why do you think God lets us get to the point where there seems to be no way out of a difficult circumstance?